The Las Vegas massacre on October 1, 2017 was a mass shooting aimed at the Route 91 Harvest country music festival on the Las Vegas Strip in Paradise, Nevada. A gunman was identified as Stephen Craig Paddock a 64-year-old of Mesquite, Nevada. He opened fire on the outdoor festival crowd from the 32nd floor of the Mandalay Bay Resort and Casino across Las Vegas Boulevard during the closing performance by singer Jason Aldean. Astrogeographic position of Paradise, Las Vegas for morphogenetic field level 1 which describes the supraregional, nationwide and internatiuonal topics of the shooting and killing: the astrogeographical coordinates are 4°Scorpio and 27°Pisces. The position in Scorpio the sign of the underworld resonates with the experience of a “paradise” in the underworld and not the heavenly realms. Pisces the sign of entertainmant, imagination, dreaming, legends, the invisible, unconscious and illusionary relates to Las Vegas as an open space for an imaginary reality. Jupiter the ruler of Sagittarius and indicator for the target itself was in Libra the sign of relationship orientation and in house 5 the house of fun, self-expression and sexuality but opposite the position of Uranus in Aries the indicating factor for the emotionality during the current era of the rising of neofascism. 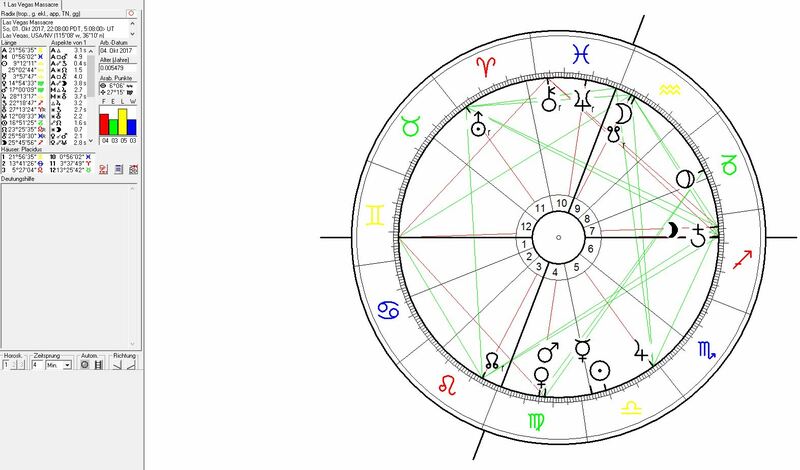 The shooting was begun with an ascendant of 21°Gemini (Moon-Uranus topics) – a degree known for the topics of intense disgust due to castration, nervousness, paranoia and attempts to get rid of the burdens of unfullfilled emotional desires. Mercury the ruler of the ascendant was on the cusp of house 5 in a constellation of gambling, playing and attempting to win. The strong Mecrury, Sun and Jupiter constellations in house 5 suggest that desire was the main purpose behind the mass shooting. Stephen Craig Paddock was born on April 9, 1953 with the Sun between 19° and 20°Aries (exact birth time umknown) in exact conjunction with the Uranus position during the inauguration of Donald Trump as American President (20°46`Aries)) which represented the first Uranus return since the inauguration of Adolf Hitler as german chanceller (19°55` Aries). Aries is the astrological resonbator for the 1st and basic circuit in the human nervous system and its function: capacity of self-defense, fighting, warfare, action, speed, competioib, strength, dominance, superiority and fatcual individuality. Aries stimulates the basic chakras in the nervous system. It`s aims are grounding in action and the material plane. Aries resonates with the level of monocausality, unicellular organisms and ego shooters. 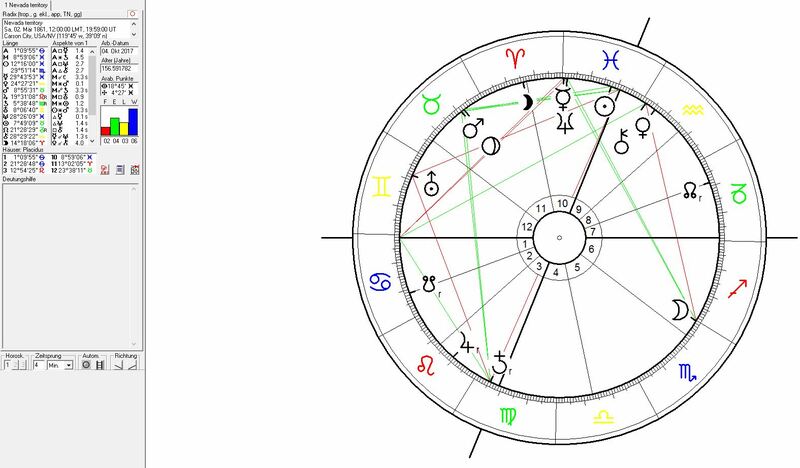 Conclusion: the position of the sun in Stephen Craig Paddock`s birth chart shows a direct resonance with the basic constellation of the neofascist era that began with the Uranus ingress into Aries in 2010/11. The conclusion here is that the triggering of emotional topics of 20° Aries during the US presidential elections and since the Trump inauguration played an important role in the 2017 Las Vegas massacre. The target selected by the Las Vegas shooter weren´t Muslims nor Islamists. The choice of Country Music fans at Las Vegas delivers the image of an emotion of disgust directed against middle class or upper class white US Americans` culture. This indicates the possibility that US american neofascism might have been the target. In the light of these considerations the ISIS claim for the authorship of the massacre comes as an attempt of the neofascist alliance between ISIS, and the Saudi & Trump administrations to distract the public from the actual motifs of the mass murder. 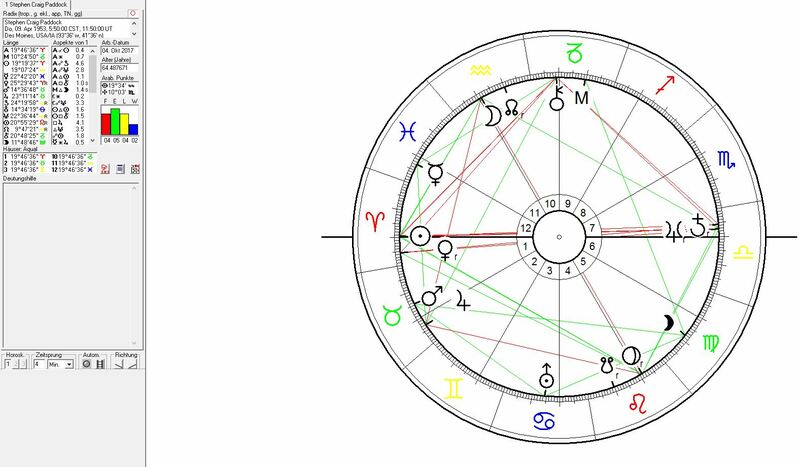 The Sun in Aries was in opposition of the minority status (Saturn-Neptune conjunction) that Stephen Paddock had to face in this incarnation. 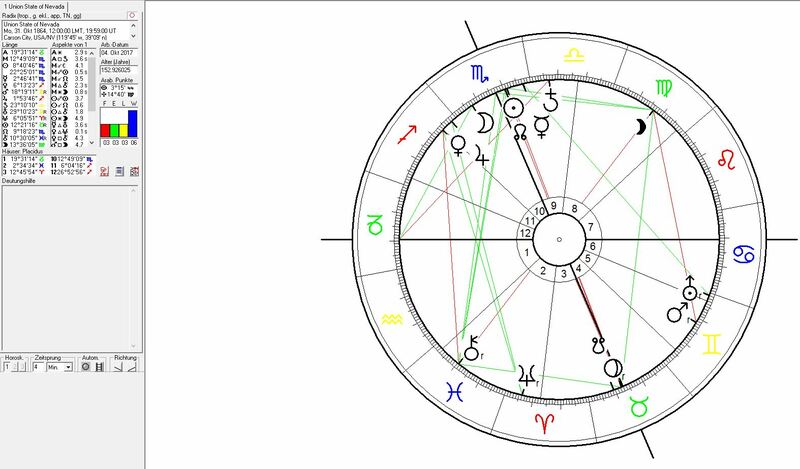 The recent transits of Uranus over his Sun-Venus conjunction seems to have triggered the decision to carry out the attack. Neptune in nhouse 10 stood for all topics related to a minority status, depression through loosing or feeling as a looser. All this makes the shooting look like a rebellion directed against the killer`s subjective, personal minority status and experience of loosing. The first step of the foundation of Nevada was the formation of Nevada Territory on 2 March 1861. 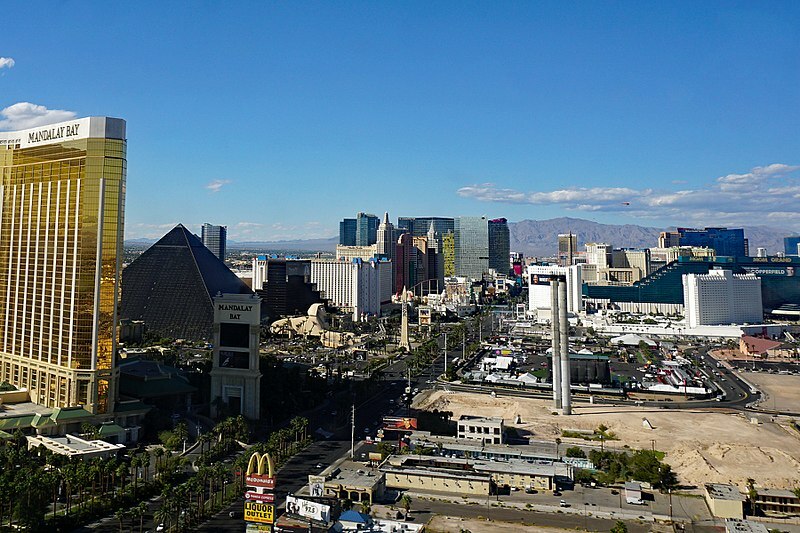 Nevada Territory was founded with a Mercury-Neptune conjunction near 28°Pisces over the astrogeographical position of Las Vegas which today is the state`s biggest city. The conjunction of Mercury with Neptune is the most archetypal of all astrological constellation in regard to corruption, ruthless exploitation of whatever ressources, the Mafia and all types of organized crime, fraud, stealing and manipulation. Mercury-Neptune also stands for the entertainment industries. The constellation shows how much Las Vegas represents the fullfillment of the dreams of the era of the foundation of Nevada. The Mars-Pluto conjunction on 7° and 8° Taurus the sign of occupation of territory stands for the violent and intensely aggressive expansion of the USA into the west. The day Nevada joined the USA again saw Mercury on one of the two astrogeographical position of Las Vegas /28°PIS-4°SCO) – this time from 2°46° Scorpio.